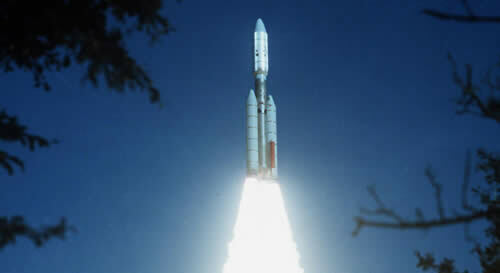 WASHINGTON, D.C.-(ENEWSPF)- Thirty-five years ago, NASA’s Voyager 2 spacecraft, the first Voyager spacecraft to launch, departed on a journey that would make it the only spacecraft to visit Uranus and Neptune and the longest-operating NASA spacecraft ever. Voyager 2 and its twin, Voyager 1, that launched 16 days later on Sept. 5, 1977, are still going strong, hurtling away from our sun. Mission managers are eagerly anticipating the day when they break on through to the other side – the space between stars. "Even 35 years on, our rugged Voyager spacecraft are poised to make new discoveries as we eagerly await the signs that we’ve entered interstellar space," said Ed Stone, Voyager project scientist at the California Institute of Technology in Pasadena. "Voyager results turned Jupiter and Saturn into full, tumultuous worlds, their moons from faint dots into distinctive places, and gave us our first glimpses of Uranus and Neptune up-close. We can’t wait for Voyager to turn our models of the space beyond our sun into the first observations from interstellar space." "We continue to listen to Voyager 1 and 2 nearly every day," said Suzanne Dodd, Voyager project manager at NASA’s Jet Propulsion Laboratory, Pasadena, Calif. "The two spacecraft are in great shape for having flown through Jupiter’s dangerous radiation environment and having to endure the chill of being so far away from our sun."